For many of us, learning how to string beads was the “gateway” that led us to learning about other ways to make beaded jewelry. Bead stringing is a fabulous introduction to the soothing nature of bead work and jewelry making. But bead stringing is so much more than just putting a bunch of beads onto a piece of beading wire and adding a clasp! For many bead and jewelry artists, making beaded art by jewelry stringing is an art form all of its own. There are skills that you need to master, like attaching the perfect crimp and learning how to handle your basic jewelry making pliers that are necessary for creating the perfect piece of strung jewelry. Jewelry stringing is how many of us learned all about jewelry-making, and learning how to string beads is the perfect introduction to learning how to make handmade jewelry. 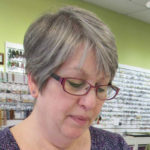 Whether you love to string bracelet designs or beaded necklace designs, stringing beads is a relaxing way to create your own unique beaded jewelry designs. Jewelry stringing projects are as diverse as the artists who create them, and with just a couple of basic stringing jewelry techniques, you’ll find countless ways to indulge your creative need for making handmade jewelry. 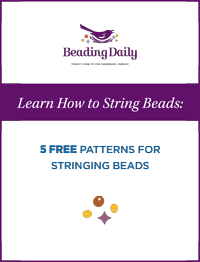 Start with this free eBook, Learn How to String Beads: 5 Free Patterns for Stringing Beads, filled with our favorite beading projects that will help you find the joy in stringing beads! Straight from the pages of Jewelry Stringing magazine, we’ve selected five of our favorite bead stringing projects, plus as a bonus, included some helpful advice and tips from master jewelry artist Andrew Thornton. Ready? Get your beading wire and crimping pliers handy! You don’t necessarily need beading wire to string beads for a beaded necklace. Learning how to string beads can also include learning how to make basic wire wrapped loops. 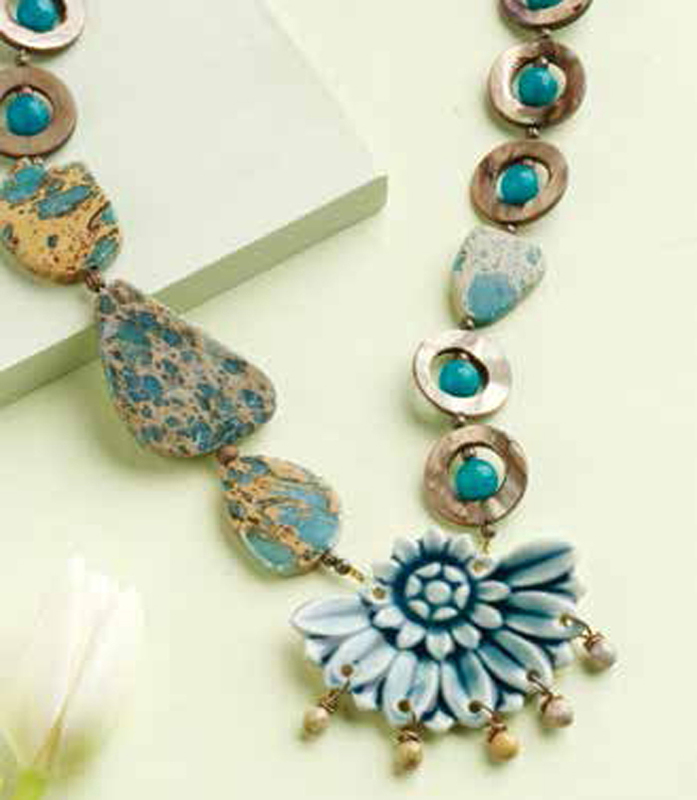 This striking mixed media necklace making project includes stringing beads on wire jewelry findings like head pins, as well as how to incorporate electric blue sari silk ribbon for a trendy but classic bead stringing project. Who says that beading has to be boring? 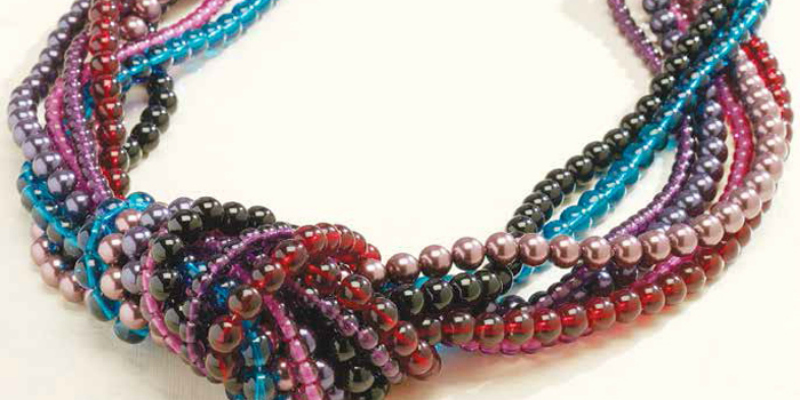 This multi-strand bead stringing necklace project uses a fun and easy knot at the center for a creative focal point! String your glass beads and crystal pearls on regular bead stringing wire, then knot them gently in the center. 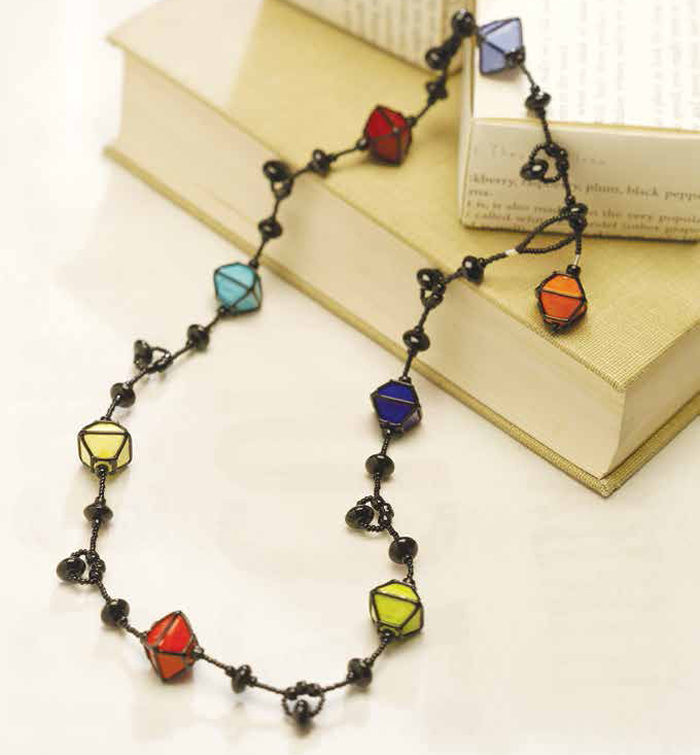 Mixing beads with classic metal chain is a recipe for fashion-forward beaded necklace making projects. Handmade lampwork glass beads are great for beading projects. Stringing lightweight glass seed beads perfectly balances the weight of the heavier handmade glass, and adds a delicate touch to this bead stringing project that’s perfect for beginners. No clasp needed for this stringing bead project – a handmade lampwork bead and a seed bead loop make the perfect closure. 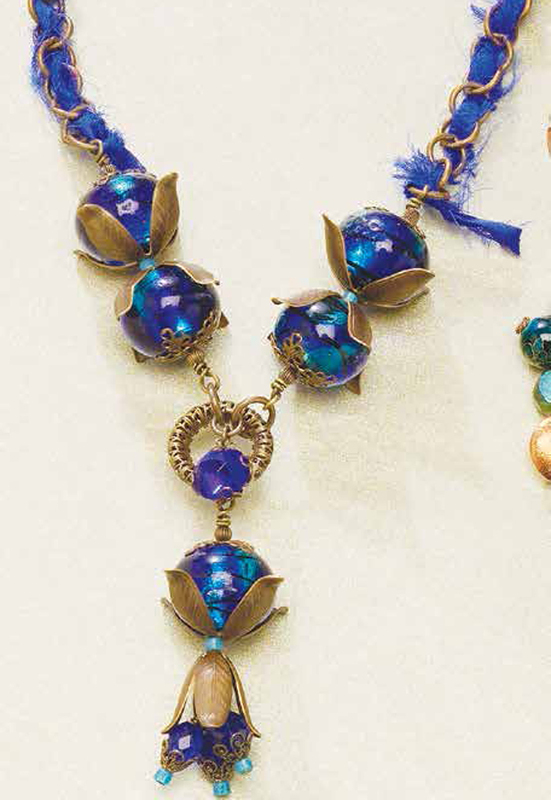 Multi-strand bead stringing techniques take on a very artful look with this filigree and glass bead necklace. A delicate metal filigree centerpiece creates a base for several strands, and a delicate beaded dangle adds the perfect finishing touch. Suspended on delicate chain, this classic bib-style beaded necklace project includes a few lovely crystal pearls to enhance the look of the round, creamy glass beads. Beading is an art form at its finest, and this eclectic beaded necklace combines gemstone beads, glass beads, and mother-of-pearl beads to create a gallery-worthy beaded necklace. Combine basic bead stringing techniques like crimping with easy wire wrapped loops to use all of your beading skills in this fun beaded necklace project. The five free beading projects in this eBook, Learn How to String Beads: 5 Free Patterns for Stringing Beads, include the basic beaded jewelry-making techniques, like crimping and basic wire jewelry skills and making wrapped loops. Use these free beaded jewelry projects to perfect your techniques and be inspired to create your own strung jewelry projects. Learn how to include mixed media jewelry supplies like silk ribbon, pre-made metal filigree components, chain, and handmade lampwork glass beads into your beading projects for fabulous and fashion-forward finished jewelry. Whether you’re just learning how to string beads, or you’re looking for a few fun bead stringing projects to make with friends for a beading or jewelry-making party, we’re sure you’ll love this collection of free bead stringing jewelry projects from the pages of Jewelry Stringing magazine! Enjoy!